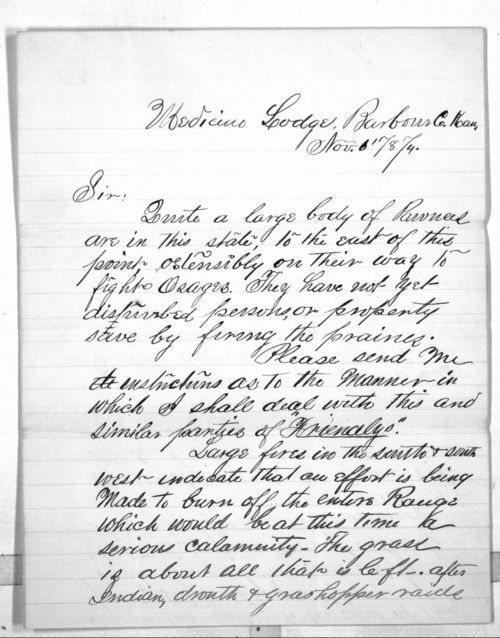 Captain C. R. Ricker of the Kansas State Militia, Medicine Lodge, Kansas, writes to Adjutant General Charles Morris of Topeka concerning a band of Pawnee Indians. Ricker notes that the Indians are just east of Medicine Lodge and believes they intend to fight a band of Osage Indians. Though this band had not disturbed any person or property, they were burning the prairie. Ricker suggests that the burning is an attempt by the Indians to further destroy settler's rangeland already devastated by drought and grasshoppers. Ricker asks for instructions on dealing with this "friendly" band of Pawnee. The threat of an Indian uprising on Kansas' southern boarder in 1873 led Governor Thomas Osborn to employ the state militia and appeal to President Ulysses S. Grant for federal troops and arms.